When you think of the indoors, the first thought that comes to mind would be “a cozy and comfortable space”. That same coziness and comfort should also be reflected on a concrete patio since it an outdoor living space. It is not enough to just add cushioned outdoor furniture and pillows. The concrete patio should also be comfortable and safe to walk on. It would also help to make it more appealing. A concrete replacement might be the traditional solution but restoring the slab would be more practical and environment-friendly. Resurfacing or refinishing the patio can make the entire space more beautiful and more functional. Durable – No one ever thought having a durable concrete patio can be done so with a minimal investment. Resurfacing it with a coating or overlay helps protect the existing slab, make it more durable, and more resistant to damage. Appealing – Everyone wants an attractive space. Having a decorative concrete patio will surely make any homeowner feel good and every neighbor jealous. Easy to Clean & Maintain – Investing in an expensive material that requires tedious cleaning and costly maintenance products is not a logical option. Decorative concrete patios are easy to clean and requires minimal maintenance. Economical – Homeowners are always looking for inexpensive options but scared that the quality might be compromised. Resurfacing or refinishing, although less costly, does not skimp on aesthetics, durability, and longevity. Stamped Concrete Overlay – This cementitious overlay is stamped with patterns and designs and then stained if desired. A stamped concrete patio is a great way of acquiring brick or stone patios simply by replicating their looks. Stained Concrete – Staining a concrete patio in acid or water-based stains is great for covering up stubborn stains and discoloration. 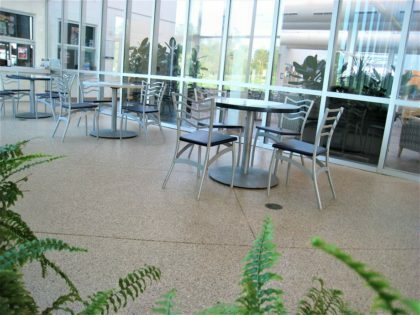 Spray Knockdown Texture – An acrylic concrete coating is sprayed and knocked down on the concrete patio for a more slip-resistant surface. This spray down concrete system also promotes a cooler surface. Learn More about Decorative Concrete Patios. Call (720) 545-1766 for a Free Consultation. Why endure unpleasant concrete patios when it can be better, both in form and function? Denver Concrete Artisans know that every homeowner deserves a comfortable outdoor space that looks good and works properly. We make sure that every project we handle is done with utmost attention to detail and craftsmanship. Want to learn more about the possible options we have for your patio? Call us for a free consultation and quote!